In spite of more than a hundred years of exploration, we still know relatively little about many of the snakes and lizards of the Americas. Only perhaps a dozen specimens of this False Coral Snake have ever been collected in the forests of Costa Rica and Panama. While this brightly colored species resembles the general shape of the blunt-headed tree snakes it seems to be more pugnacious and will strike at a disturber. This False Coral Snake is one of several dozen species that form a mimicry complex associated with the deadly poisonous coral snakes of the Americas. All share a pattern of banding in various combinations of black, and shadings of reds and yellows. While the patterns differ from place to place, they are strikingly similar in any locality. 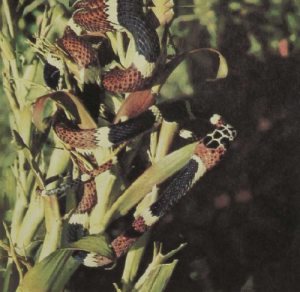 The assumption is that the pattern becomes “known” to potential predators and that these avoid the coral snakes as well as their mimics. Yet many of the mimics are themselves mildly poisonous and may contribute to the reinforcement of the signal in potential predators. While the system has been known for more than a hundred years, its complexities are still the subject of fruitful study today.